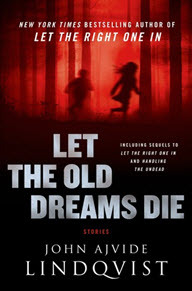 Recently at the library, I came across Let the Old Dreams Die by John Ajvide Lindqvist. After looking it over, I realized that one of the stories in it tells more of what happens next to Oskar and Eli, whose story began in Let Me In. I saw both movie versions of this several years ago, but had never read the book. I decided I wanted to read the original before moving on to read about their further adventures, and during my reading of Let Me In decided to re-watch the two movies, too. POSSIBLE SPOILER ALERT: While I think the premise of these movies has been pretty well advertised by now, it is possible that talking about the book might ruin it for those that haven’t read it yet. As is often the case, I thought that the book was so much better than the movie! In the book, Oskar’s personality is a little more defined. He keeps a notebook of murders and kind of romanticizes the idea of being a killer. When the first murder in the woods happens, he actually considers that it is possible that he caused the murder telekinetically by thinking about it and stabbing a tree with his knife, at least until he learns the actual details of the murder. Additionally, there is more told of Eli’s back story and becoming a vampire, and Eli is able to communicate this story to Oskar through mental images via a lingering kiss. Some characters that were important in the book are left out of the movie versions, like Tommy, the older boy who lives in the apartments and uses the basement room to get high with his friends. Tommy is also an influence on Oskar and seems to at least tolerate him and somewhat befriend him. Probably the major character difference in the book that became important was the nature of Hakän, Eli’s protector/servant. Hakän has a history of pedophilia, which ended up causing him to lose everything. Eli rescued him from that fate, but he still has those proclivities, which Eli rebuffs but she still manages to use his desire as a way to keep him procuring blood for her. The relationship between these two, then, is much different than what is portrayed in either of the movies. It was extremely interesting to read and watch these in close succession. In all instances we see Oskar bullied at school. We see him and Eli meet for the first time in the apartment playground, there are comments on her not feeling cold, and there is a sharing of the Rubik’s cube. We see Oskar become more resilient and fight of the bully. Oskar and Eli talk to each other through the wall using Morse code, and Eli flies into Oskar’s bedroom to sleep beside him one night. And then there are Hakän’s murders going on, and him becoming cornered and using the acid to disfigure his face. Eli visits Hakän in the hospital and bites him, after which he plunges several stories to the ground. We see Oskar as he first sees Eli in action, attacking a man who has disturbed her rest in the bathtub, and we see Oskar close the bathroom door. And, we see the climactic scene in which Eli rescues Oskar at the pool, amidst much murder and mayhem, and then the closing scene with Oskar and Eli on a train to another life using Morse code to quietly talk to each other through her trunk. As always, there were changes from the book for the movies, and there were some interesting choices made. Differences abound not only between the movies and the book, but also between the two movies. The Swedish version, Let the Right One In, sticks most closely to the original storyline. However, the American version, Let Me In, makes some substantial changes, starting with the names of the characters. Oskar becomes Owen and Eli becomes Abby. In neither movie do we see Tommy as a character, or learn about Oskar/Owen’s somewhat lackluster appreciation of the rock group KISS. However, in the American version, we see a nod to this with Abby appearing at one point in an old KISS concert T-shirt. In neither movie do we see Hakän revived after Eli visits him in the hospital and he falls several stories to the ground. No Tommy and no revived Hakän means that we also do not get the truly scary incident in the basement hangout. I found the stick with which Oskar/Owen smacks the bully especially interesting, since it seemed to grow larger and more brutal from the book, to the Swedish movie, until finally in the American movie the stick is taller than Owen and made of heavy metal. I was shocked that the bully lived through the attack. The Swedish movie also only hints at the strangeness of Eli/Abby’s sexuality, while the American movie disregards this completely. Eli/Abby’s character is also strikingly different in the two movies. The Swedish version shows her as almost a victim of her disease, while the American version shows her as much more of a predator. In the latter version, she moves unbelievably quickly and her attacks are ferocious. Additionally, her interaction with Hakän/The Father is more authoritative and violent in the American version. Hakän/The Father has different methods of doing his killing in the two movies, as well, which I thought was odd until I realized that here in America he could have frozen to death waiting to find someone just walking along through the woods. Hiding in cars was a much more believable proposition for Americans. Some things that I found especially interesting were the ways that problematic sexuality was left out of the movie versions. Additionally, in the American version Owen finds a picture of Abby and The Father showing them both as the same age, which leads to the conclusion that their relationship may have originally began in much the same manner as Owen and Abby’s. This concept of Abby as almost an enslaver is a somewhat different portrayal of this part of the story than what was in the original book, where Eli is also a rescuer. Encountering the salient points of the story again and again was interesting. I noticed things that made me want to connect with the titles. What does it mean to “let the right one in”? The book refers this back to a Morrissey song that references dreams and ideas. In this story, though, there seems to be a lot to do with monsters or monstrous behavior. The one who would typically be considered a monster, is much kinder to Oskar than many of the humans he encounters. The bully is an obvious monster, but his parents are also less than capable. Asking the vampire to come in, then, takes on a different perspective. And, what are we to make of Oskar’s acceptance of Eli? His assistance, or at least lack of intervention during the bathroom scene? Is that the point, then, at which Oskar makes his own decision to let the monster inside himself in? Eli does not ask him to go with her when she leaves the first time, and it is possible that Oskar would not have gone at that point, not until he saw her as a potential eternal champion, someone as willing to spill her blood for him as he had been to spill his for her. Ultimately, Oskar makes his choice to join with her, and we can’t help but agree with his decision. I look forward to seeing what comes next for them. A very well written article. I’ve seen both movies and agree on all your points, now I’m going to have to read the books. Thank you.